Our range of dental chairs includes the most efficient and hydraulically operated dental Chair with hanging delivery system, named Victory. Victory features an ergonomic design so as to provide comfortable sitting to the patient and convenience to the dental professional for carrying out different dental tasks. 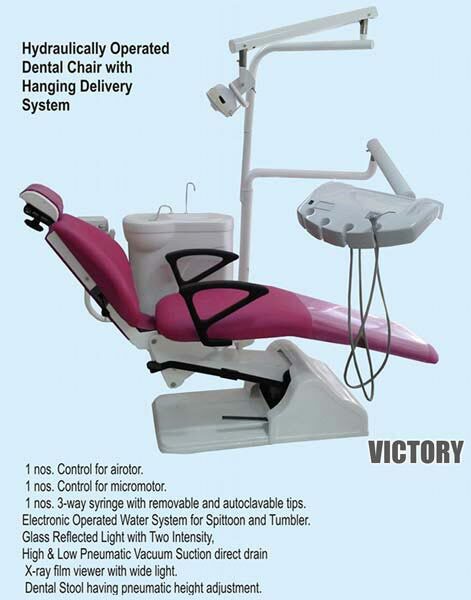 Victory Dental Chair includes 3-Way syrings with removable and autoclavable tips, electronically operated water system for spitton and tumbler, glass reflected light with two intensity, high & low pneumatic vacuum suction direct drain, X-ray film viewer with wide light and dental stool having pneumatic height adjustment.